The Barn Owl with its heart-shaped face is 18 in. high with a wing span of 44 in. These highly valued, rodent-eaters will have an ideal residence in this very large house which comes with wood chips. RANGE: Resides from southern British Columbia east through the Dakotas and Michigan to southern New England, and southward, as well as the West Coast area. HABITAT: Lives in open country, forest edges and clearings, cultivated areas, cities and farms. 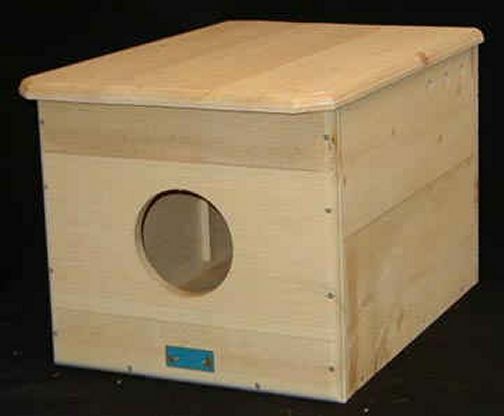 IMPORTANT NOTE: Due to its very large size and weight, this owl house comes unassembled, but the assembly is very easy! The only tool needed is a Phillips head screwdriver (or preferably an electric drill with a Phillips head bit on it). There are 34 screws that need to screwed into pre-drilled holes. Easy to follow directions with pictures are included. However, if you want to receive this as a fully assembled product, however, we can deliver it this way for an extra shipping charge of $20 (for a total shipping charge of $40) - just mention this in the COMMENTS section of the Checkout Page and we will accommodate you!